Graffiti is the most undervalued channel of communication today. The world of graffiti has evolved over the years, from its early beginnings in the streets of the Bronx to taking centre stage in commercial campaigns, opening the doors of art galleries and legally beautifying our cities across the world in unique ways. Call it a personal passion but I’ve always kept my eyes peeled for these unique pieces of work, all around the world. One thing is certain over the years, the negative connotations of graffiti with illegal vandalism have changed and graffiti has become more mainstream and its commercial potential has exploded with many global brands taking notice. The only reason its commercialization hasn’t occurred more quickly is graffiti’s inability to clearly show results to companies through measurements they understand. Nike, Gucci, McDonalds, BP, Coca-Cola, what do all these brands have in common? *Gucci DIY ArtWall in Brick Lane, London, celebrating the brand’s philosophy of self-expression. 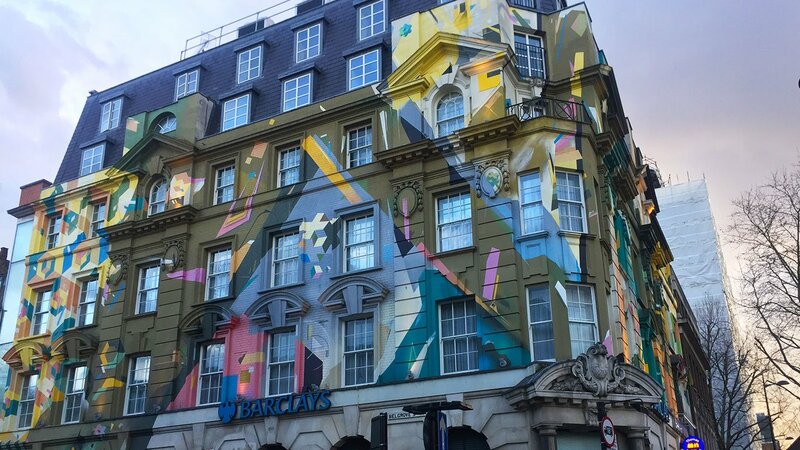 Major brands have sponsored graffiti artists to create pieces of work targeting the ever more important millennial market, like Gucci’s DIY ArtWall in Brick Lane, London by New-Orleans based painter and entrepreneur Sarah Ashley Longshore’s. The piece combines the themes of Hollywood glamour, western consumerism and modern pop culture while capturing the attention of hip and trendy passerbys. In a world of bombarded messages from brands everyday, everywhere we walk, everywhere we look surely an advertising message can be found, our mind has become accustomed to this and our minds have learned to blur out this annoying messaging. The crucial millennial consumer has become even more adept at blocking advertising messaging and any sign of a sales push and your chance of engagement are out the door. And this is what sets graffiti apart from all the other main channels of communication that advertisers use. Graffiti and street art because of their nature of been an authentic artistic representation of the political, social, and cultural issues are able to easily capture people’s attention in ways typical advertising cannot dream of. London boasts one of the most vibrant scenes of graffiti and street art around the world, with large areas of the city displaying legal graffiti to the swarms of tourists and daily commuters keen to view this art form. Living in the centre of London, we are able to notice the power of street art and graffiti everyday. Packed guided tours by graffiti artists frequently take place in trendy Brick Lane and Leake Street, where both by daily commuters and tourists are constantly photographing major sponsored commission pieces of work, both by large brands and small savvy local business owners. Nowhere is the power of graffiti and street art as a means of advertising more evident than the streets of London. Has graffiti finally broken its negative perception with illegal activities and become the next big thing for companies targeting millennials?